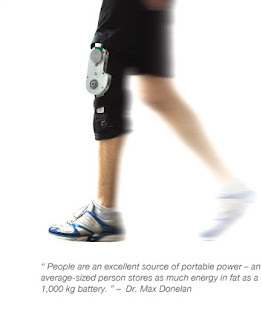 Bionic Power is a privately-held technology company located in Burnaby, B.C., Canada. Their Biomechanical Energy Harvester uses the energy your body creates during the process of walking to charge portable batteries. The device, which after development should weigh about two pounds, is geared towards people need easy, cheap portable power. The company is targeting their product to the military, emergency use, medical (prostheses) and general consumer use. The options are endless really. And using it is one more excuse to get me off my duff to exercise! i think these things are sooo cool. if only they could provide the support that the brace my orthopedist "prescribed" . . .